Aren't this series of stamps "My girls" a hoot? 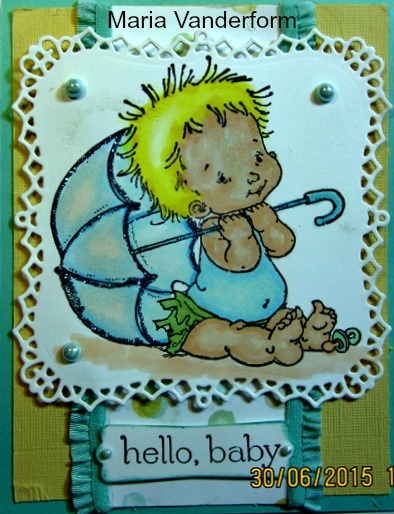 One of the members of a Yahoo group I belong to challenged us to make a card from a digital download picture of one of her stamps. This is the picture that was downloaded. I elected to use only 1 of the images. 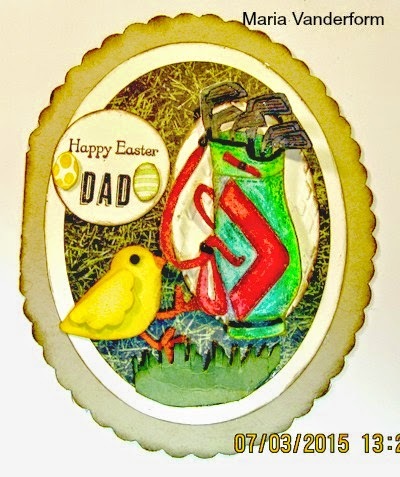 I made it into an Easter card. Using the largest of the Oval framelits, a card was made by extending at least 3 scallops over the edge of the framelit at the fold. Then a smaller Very Vanilla framelit was die cut and adhered to the front. The DSP I used was the image of grass - perfect for a golfer. It was die cut in yet another smaller size. All of these had their edges sponged with Soft suede ink. The gold bag was coloured with watercolour pencils, and the colours blended with an Aqua painter. 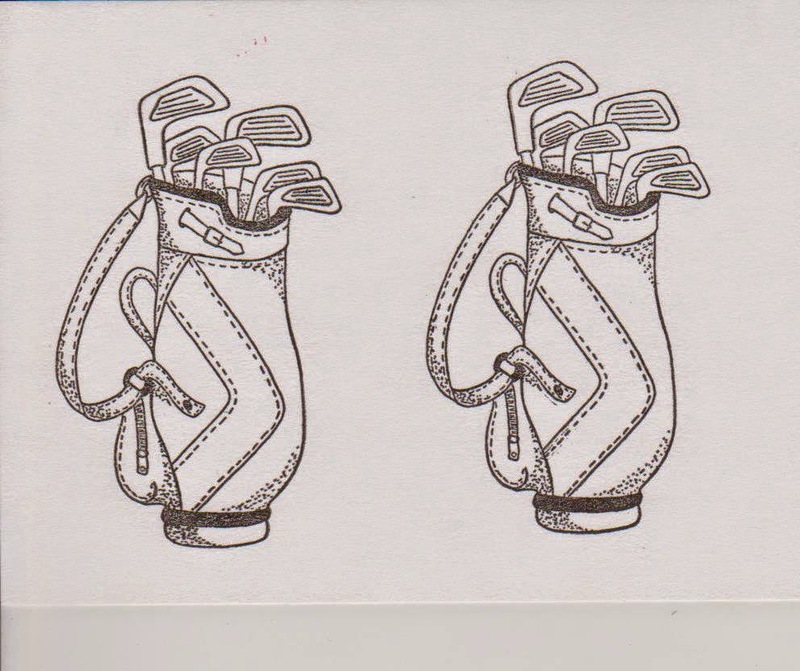 I used a silver pen for the golf clubs and then added crystal effects to make them look like metal. 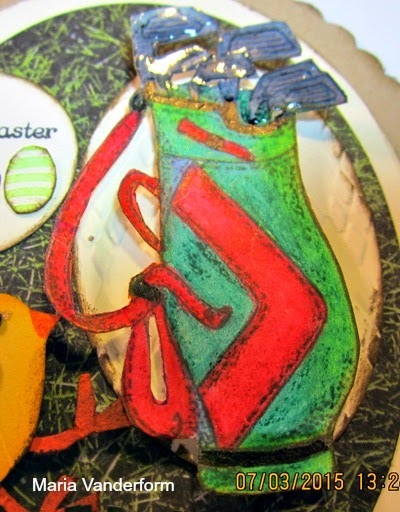 After the crystal effects had dried, the golf bag was cut out, and adhered to a small Very Vanilla oval embossed with an Argyle embossing folder - using dimensionals. This is a close up of the golf bag. Then to make it look more like Easter, I punched a chick using the Bird Builder punch (and the scallop oval punch for the wings). The chick was placed in the grass as if it were trying to climb up the bag. At the bottom of oval, I cut a piece of Always Artichoke with the fringe scissors to mimic grass. The sentiment was from Teeny Tiny Wishes and Greeting for Guys. It was punched with the 1 1/4" circle punch. Two tiny Easter eggs were adhered on either side of the sentiment. Labels: Easter, golf bag, mystery challenge #2, Oval card. 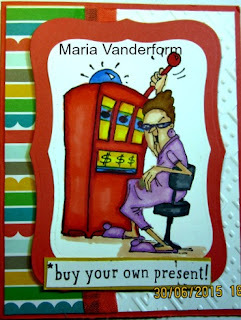 © 2011 Simply Cards By Maria and Maria Vanderform. All rights reserved. Awesome Inc. theme. Theme images by Jason Morrow. Powered by Blogger.